Book Review and GIVEAWAY- "The Purpose Driven Life for Kids"
Based on the New York Times bestselling book The Purpose Driven Life, this 365-day devotional The Purpose Driven Life Devotional for Kids, offers inspiration for children 9-12. Most children at this age form their foundational thoughts about God and their place in the world. Thank you Zondervan for sending me this book to review and for sponsoring a giveaway for this same book! I was not paid for this review and all opinions expressed are 100% mine. 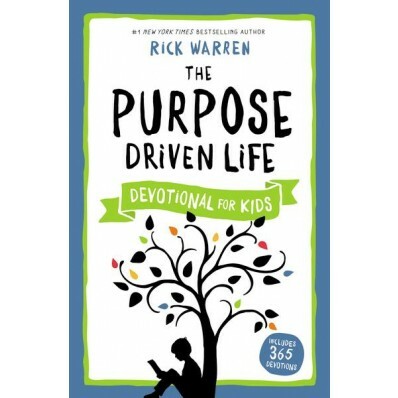 I remember several years ago I read the adult "Purpose Driven Life" with my husband. He was at the time only my boyfriend but we made it important to start a good foundation with devotionals being a big part of who we are. Now that we have been married for 9 years and have two children we are always trying to find new ways to encourage them in their relationship with their Daddy God. This kids version is geared for 9- 12 year olds. My daughter just had her 8th birthday and she really wants to read this book and so far she has been doing just fine. I imagine as she continues there might be more questions to answer for her. I started to read the book as well because sometimes kids books can speak volumes to me. I realized I need to keep reading it when I read day two of "The Purpose Drive Life for Kids" when it asked a question that I have asked my self. Seriously though when you read in 1 Chronicles the long list of names that keep going I always say God why do I need to know all these names. This devotional reminded me that God Honors heritage and his followers and it is awesome to think about how all these names were so important to the nation of Isreal. Each page of this devotional only takes a few minutes which makes doing a daily devotional simple. Getting my kids to read their bible and do a devotional is so vital to me as a mom. I hope they grow to love doing it as I never want it to become a chore for them my prayer is for them to want to do it all the time. This devotional is only $15.99 on Zondervan. I recommend this for your kids or even yourself! Please take a minute to enter this giveaway using the easy Rafflecopter form below. Praises of a Wife and Mommy is not responsible for the shipment of this prize. I make sure to do it in the morning or before bed. I always make sure to do a spiritual time before bed. If you have morning devotions, you know that you start the day right! We have quiet time each morning.